She was the daughter of Italian parents. First she studied under Frida Wadnai in Budapest, then with Giannina Russ in Milan and, at the end, under Teofilo de Angelis in Rome. 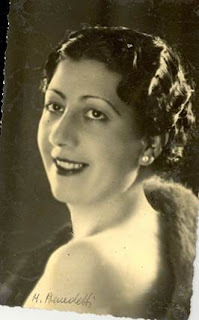 In 1934 she made her debut at the Teatro Regio in Parma; then she had in Rome as Etra in ‘’Fedra’’ of I. Pizzetti a sensational success, so that she sang the same part in 1939 also at La Scala in Milan. Then she developed a significant career at the leading Italian opera theaters, above all at La Scala, where she appeard as Ortrud in ‘’Lohengrin’’, Ulrica in ‘’Ballo in maschera’’ and in 1948 as Herodias in ‘’Salome’’ of R. Strauss. She had a huge success also at the Teatro dell'Opera di Roma, where she was highly acclaimed by the audience. In 1939 she sang there among other things in the premiere of the opera ‘’Monte Ivnor’’ by Lodovico Rocca, in 1953 she participated there in the premiere of the opera ‘’Medea’’ of Pietro Canonica. She gave guest performances in Barcelona, Rio de Janeiro (1940), Buenos Aires (Teatro Colón), Vienna and in Paris. She also guested regularly at the famous Italian theaters, thus already in 1938 at the Teatro Comunale in Florence as Ulrica and as Margherita in ‘’Guglielmo Ratcliff’’ by P. Mascagni, in 1951 again as Ulrica, in 1950 atthe Teatro Comunale in Bologna she appeared as Herodias. In the 1949-1957 seasons she performed over and over again at the festival of the Terme di Caracalla in Roma. Her stage repertoire included also Azucena in ‘’Trovatore’’, Eboli in ‘’Don Carlo’’ and Principessa in ’’Adriana Lecouvreur’’. She was also known as an interpreter of parts in contemporary operas of Zandonai, Pizzetti and Respighi.